Has anyone attempted to convert the Hornby H Class to P4? I have two Hornby locos of this engine, and a Southeastern Fineccast chassis. To my mind there are two possible solutions. 1. Use the Southeastern Finecast chassis. 2. Use an Alan Gibson Wheel Set for the M7 conversion which has 3mm axles. Immediate issues with option 2 are that the Hornby axles are 2 mm so would require some sort of sleeve to accommodate 2 mm axles and 3mm bore on the wheels, not impossible but requires finding brass tubing with the correct inside and external diameter. Option 1; I have a SEF chassis and it looks like it would require a lot of surgery to make it fit. Additional issue with eiher options is the need to ensure sufficient clearance in the splashers which will require removing a large amount of material, I have measured it and think it possible, but not easy. I’ve been messing about with an SEF “P” class chassis to convert the Hattons offering. To get the ride height correct I found it necessary to take about 1mm off the top of the SEF frame and lower the spacer slots and modify some spacers as well. It is a bit of a faff but seems to be working out but unfortunately a house move has stopped progress. Long story short, it is possible but does require a bit of patience. On the plus side the SEF chassis can be compensated or sprung whereas the Hornby would be rigid. Many thanks for those thoughts. I think it is possible to adapt the SEF chassis but it might take a bit of butchery. I agree that this allows the opportunity to introduce sprung chassis, or compensation (whatever your preference), however the Hornby set up runs beautifully, if a simple (?) drop in conversion is possible I would probably go for that. There are issues with clearances with all options. I haven't yet been asked to convert an H Class but I suspect one may be in the offing. I am not surprised Hornby have used a 2mm axle diameter as they seem to do this a bit these days. There are three options with 3mm axle wheelsets (or 1/8", come to that). One is to turn up some axles with reduced diameter ends - this is only any good if you have a lathe and an accurate 3mm or 1/8" collet, a 3-jaw chuck is not generally good enough. Second option is to obtain some 2mm I/D - 3mm or 1/8" O/D bushes. Third option is to mount the Hornby wheels by their axles and turn off the tyres, replacing them with Alan Gibson tyres of a suitable diameter. Again, this will only work if your lathe chuck/collet is very accurate. The centres can then be drilled out, and a friend who has done this on the Hornby Peckett reported that gently reaming the axle hole produced a good fit on a 2mm axle. I don't have access to my Sharman wheel book just now, but I would check whether the Gibson M7 wheels are actually correct for the H. They have a 9" crank throw and have a representation of the contour where the spokes meet the tyre on a Drummond LSWR wheel which may not be correct for an SECR engine. This representation is a sort of 'half Stanier bevel', whereas the equivalent Ultrascale wheel has the correct shape. As do Hornby on their LSWR engines come to that. Whatever you decide to do, the Hornby chassis (if it's built the same way as the M7) will give you reliable smooth running and will be quite sure footed provided your wheels are absolutely concentric, and if you take care to make sure that all eight wheels rest properly on a surface plate. You may find that washers are needed (or not) under the bogie to adjust for the differences that may exist between the Hornby wheels and replacements. Last edited by Philip Hall on Sun Mar 10, 2019 1:10 pm, edited 1 time in total. I think when I spoke with Alan after getting my first H class at Scaleforum last year he recommended a wheel that was the nearest possible match (iirc the exact wheel size is not in his range). He offered 2mm or 3mm axles iirc. I'm not at home to check what I ended up buying from him, but if I remember I'll check when I'm back home. Many thanks to those who have responded to my query. All were helpful and raised an issue I had not fully considered, namely the wheel selection. and have not used one since O Level metalwork over 50years ago! I think I have a kitchen table solution so will proceed with that. I will certainly report on progress. I will also proceed with my SEF kit of the H Class, incorporating a sprung chassis. It will be interesting to compare the results. The choice of wheels requires further research. I am away from home at the moment but will look up my Sharman wheel book when I return. Don't forget also that Mr Wainwright's engines were left footers. book) is 5’6”, 16 spoke, 22” throw, pin inline. Bogie is 3’7” 10 spoke. Actual throw is more important (to me) than pin location; too great and the rods will clout the underside of the footplate, too small and the engine will look wrong as it goes along. The Hornby model, from experience of other models, will have the correct crank throw. The M7 wheel has 18 spokes, 9” throw and the wrong contour at the rim, as per my last post. If you are going to have to source bushes then a standard 1/8” axle is of no consequence. Alan GIbson does 4M68, 1/8 to 2mm reducing bearing/sleeves so that should solve the problem. If the axles turn out to be 3mm then reaming the bearings and drive gear out to 1/8” should not be a problem. PS my catalogue numbers come from a 2010 catalogue I have in the workshop, but I don’t think any new wheels around that size have been made recently. Apologies if they have! Thanks very much everyone, very useful information. PS, loved the left footer info. I think I knew but thanks for the confirmation. So how many people want H class wheels? Drop me an email if you do. I don't think I can do them before S4N but you shouldn't have to wait 10 months. billbedford wrote: So how many people want H class wheels? FCA wrote: Don't forget also that Mr Wainwright's engines were left footers. The Wainwright H Class was derived from the LC&DR R Class 0-4-4T, which also had 5ft 6in, 16-spoke wheels, with 11in throw on the crank pin. Wainwright's version of the R Class, the R1 Class, also had the same specification of driving wheel. 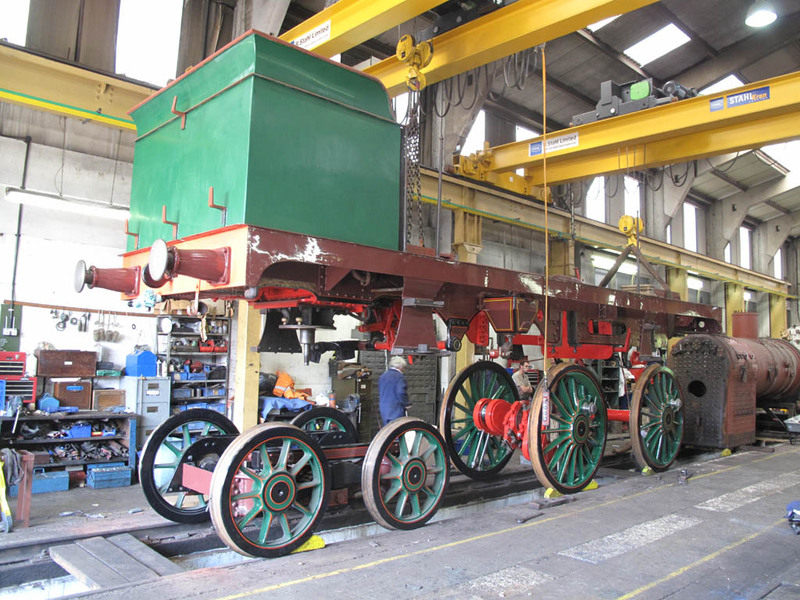 Other LC&DR classes also had 5ft 6in (some 5ft 7in) dia driving wheels with 16 spokes, eg A1 and A2 classes of 0-4-4T and the two classes of Scotchmen. As I seem to be the only one who models LC&DR locos in P4 (or am I? ), it probably won't help with the sale of many such driving wheels, but I'd be interested in two sets for 0-4-4Ts. Wonder what the minimum quantity is that Bill would require to start production? I have two Hs currently, so two sets would be of interest. Two sets for me as wel please. All you listing your wants on here might like to note what Bill wrote. richard49 wrote: Has anyone attempted to convert the Hornby H Class to P4? I have two Hornby locos of this engine, and a Southeastern Fineccast chassis. To my mind there are two possible solutions. That reminds me that some people might still have the old Sharman Wheels for the "H" hidden away in a drawer somewhere, but Bill's modern-day solution would hopefully look a bit better! A long time ago at the genesis of P4 the only 5'6" wheel available was actually based on the H class wheel specification. They were made by Studiolith, of not so blessed memory, and on whom Ultrascale had nothing in terms of waiting time. Also they were pretty good products have shouldered axles fitting into an integral brass boss which ensured the correct back to back. However, the devil's own work to convert to split collection which is my own preference. Photo of 31306's underpinnings attached. FCA wrote: A long time ago at the genesis of P4 the only 5'6" wheel available was actually based on the H class wheel specification. Didn't those wheels end up in the Alan Gibson range?